At least two injured in ramming attack outside Kiryat Arba near Hevron. Terrorist neutralized. At least two soldiers were injured in a ramming attack outside of Kiryat Arba near Hevron Tuesday afternoon. According to initial reports, an Arab terrorist drove his car into a group of IDF soldiers positioned outside the entrance to the Palestinian Authority-controlled village of Beit Einun, northeast of Hevron. Two members of the squad were lightly injured in the attack. MDA and United Hatzalah emergency first responders were called to the scene and treated the injured soldiers. After receiving first aid, the two soldiers were evacuated to Shaarei Tzedek Hospital in Jerusalem. The terrorist was shot and killed during the attack. 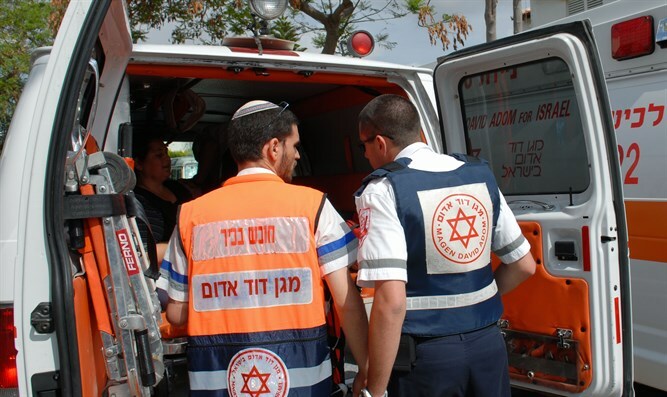 "Together with other EMS teams in the field United Hatzalah volunteers treated two people in their early 20s who were lightly injured during the incident after the attacker had been neutralized by security forces," said United Hatzalah spokesman Raphael Poch.